Classic board game against the computer with modern user interface, intuitive control, and rich features. Difficulty settings for every skill level are available. The application is compatible with Windows XP, Vista, 7, and 8; both 32-bit and 64-bit editions. Chess 2012 comes in two editions. The Free Edition is cost-free. The Pro Edition has more features and requires a purchase of a serial number. i dont like it ,,, what about u ? It is a good chess program for beginners. @noor124 wrote: i dont like it ,,, what about u ? 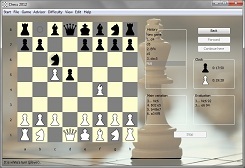 Steve.R wrote: It is a good chess program for beginners. The Pro Edition of Chess 2012 ($6) provides a considerably stronger opponent. as what brother steve says ( It is a good chess program for beginners.) but im comparing it with fritz and chessmaster , thats all ..
by the way i have some ideas i will send it soon by pm for u . @noor124: Sure, I am looking forward to hearing from you. Thanks for the new release Filip. - New feature: Adjust to the time control. - Fixed problem with program start on some systems.